With spirometry, the patient is instructed to inhale and exhale calmly. A Tiffeneau maneuver is subsequently performed, i.e., the patient first exhales completely, then inhales as deeply as possible to exhale again as quickly as possible (forced expiration). Here, different values such as FEV1, vital capacity and respiratory flow rate (spirometry | quantitative assessment) can be measured. 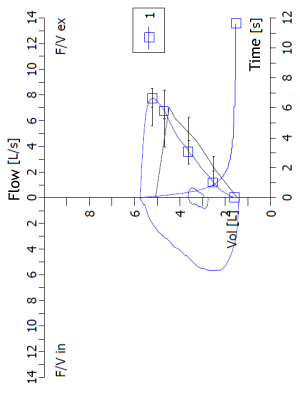 In the flow-volume loop the air volume breathed (x-axis) is plotted against the respiratory flow rate (y-axis). Sometimes the axes are switched around. 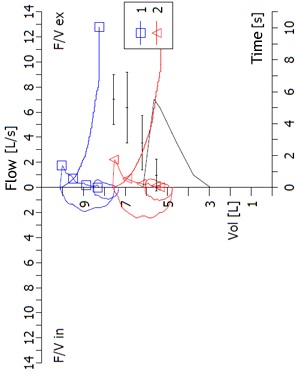 Respiratory flow is defined as negative upon inspiration (thus, inspiration downwards) and positive upon expiration (thus, expiration upwards). The shape of the curve can be explained by the fact that the flow first increases upon inspiration and then diminishes again. Thus, the curve has a “belly” pointing down in connection with inspiration. 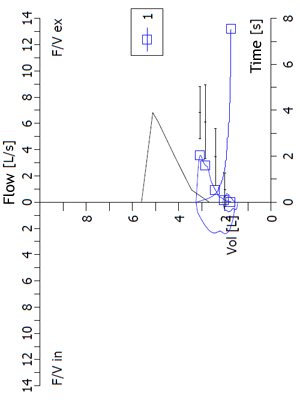 With forced expiration, peak flow is arrived at very quickly (within 120 ms) with a subsequent linear drop in flow intensity. With restriction, it is primarily the vital capacity that is decreased; respiratory flow is only minimally influenced in its curve shape (but peak flow is decreased), as restrictive situations affect the lung tissue and not the bronchi. 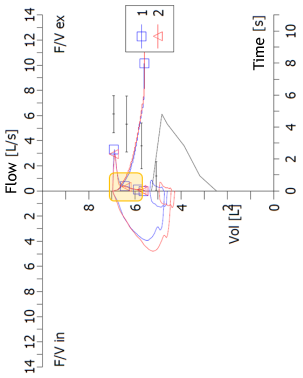 Thus, the curve narrows along the volume axis; it is however not compressed along the flow axis, resulting in the typical egg form. With obstructive conditions, respiratory flow is decreased due to the increased resistance in the bronchi. Changes in vital capacity only occur in connection with additional presence of emphysema, when the residual volume is increased at the expense of vital capacity. 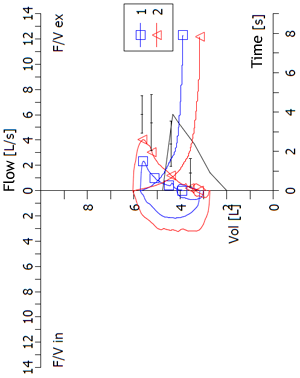 Hence, the typical armchair shape with compression on the flow axis and scarcely and change on the volume axis. An additional emphysema kink arises when collapse of the bronchioles occurs during expiration, with accompanying acute reduction of respiratory flow. Despite increased residual volume, vital capacity can be normal with emphysema, or even above normal. This is due to the fact that emphysema is associated with a loss of a large portion of the elastic fibers of the lung tissue, which are responsible for the retraction forces of the lung. Since it is this retraction force which limits the extent of inspiration , the total lung capacity also increases, often reflected in normal vital capacity. However, the elastic fibers are also instrumental in keeping the bronchi open during forced expiration, so that their loss is associated with a collapsed bronchial system and thus with obstruction. Dyspnea, suspected obstructive or restrictive ventilation disorder. 31-year-old female Findings: unremarkable, closed curve progression. Findings: armchair shape, typical of obstruction. Minimal change in the curve prior to bronchodilation (blue) and subsequent to bronchodilation (red). Findings: armchair shape, typical of obstruction with additional emphysema kink. No change during bronchodilation. Findings: armchair shape, typical of obstruction, prior to bronchodilation. Nearly normal curve after bronchodilation (red).